"The global financial and economic crisis has also demonstrated the resilience of alternative financial institutions such as cooperative [...] I encourage all stakeholders to continue building awareness and pursuing policies to strengthen cooperatives everywhere. By contributing to human dignity and global solidarity, cooperatives truly do build a better world." In 1992, the United Nations General Assembly proclaimed, in its resolution 47/90 of 16 December 1992, the International Day of Cooperatives to be celebrated annually on the first Saturday of July. Strengthen and extend partnerships between the international cooperative movement and other actors, including governments, at local, national and international levels. 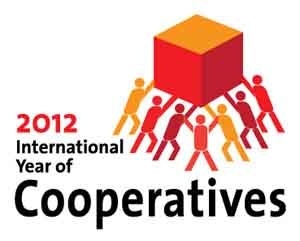 This year's theme links to the observance of the United Nations International Year of Cooperatives. It seeks to encourage the growth and establishment of cooperatives all over the world, and to recognize the actions of cooperatives in helping to achieve internationally agreed upon development goals, such as the Millennium Development Goals. Encourage Governments and regulatory bodies to establish policies, laws and regulation conducive to co-operative formation and growth. By raising awareness about cooperatives, the Year will help to encourage support and development of cooperative enterprises by individuals and their communities.